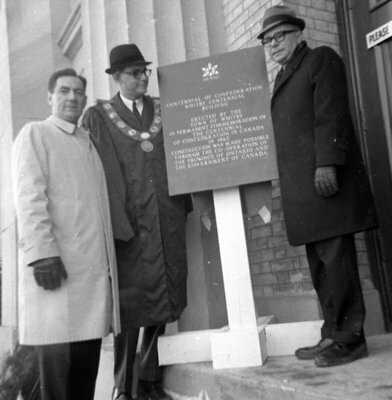 A black and white photograph of Tom Edwards, Mayor Desmond Newman and Dr. Kenneth Hobbs standing in front of the Centennial of Confederation plaque for the Whitby Centennial Building. Whitby Centennial Building Opening, February 18, 1967, Brian Winter. Whitby Archives A2013_004_095.